This circuit is EEPROM programmer for type 24CXX. 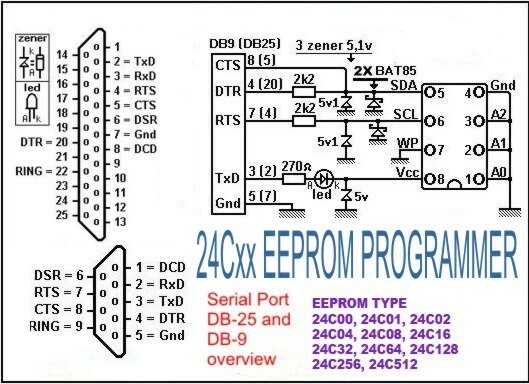 EEPROM type 24CXX usually used in Color television or other electronics project. it supports 24C01, 24C02, 24C04, 24C08, 24C16 24C32, 24C64, 24C65, 24C128, 24C256, 24C512 IÂ²C Bus EEPROM. The software interfacing with PC available in Indonesian language at here for download. The screen shoot display software like on picture below.